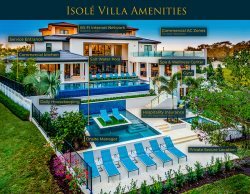 Discover the true magic behind vacation homes with this amazing 7-bed luxury villa, located in Reunion Resort. You will enjoy discovering all of the hidden icons and unexpected surprises throughout the home. This villa features kids bedrooms and some with secret doorways leading into a kids' zone complete with a stage. Share hours of fun in the two games room or your own home theater or simply lounge by the oversized pool with fantastic golf course views. The open concept floor plan is perfect for spending quality time together. Relax in the living area with comfortable sectional sofas surrounding the 70" LED TV, Blu-ray player, surround sound and beautiful ceiling beams that create a luxurious and inviting feeling. The living room TV has an Apple TV 2 installed. Play games with the fun apps or sign-in to your Netflix account to watch your favorite TV series. Prepare delicious meals in the gourmet kitchen boasting stainless steel appliances, 2 ovens, an oversized refrigerator, granite counters and beautiful custom cabinetry. There is counter seating for 5 around the kitchen island. Enjoy formal meals around the great dining table with seating for 18. Signature Estate has 5 master suites all offering king size beds, private bathrooms, large flat screen plasma TVs and ceiling fans. Three of these master suites are located on the ground floor while the other two are located on the second floor. Bedroom 6 and 7 are truly fun rooms that will be the highlight of the kids' vacation! The bedroom whisks the kids off to the common room complete with 2 custom full over full bunk beds, sitting area and faux bookcase. Use the bookcase to enter into a hidden kids area with a fun karaoke machine. The second kids' room transports the kids into a storybook world. The room has 2 twin/twin bunk beds and a twin daybed for your little princess. The attention to detail in the kids rooms will truly blow you away. Both of the kids rooms also feature an Apple TV 2 so the little ones can enjoy their favorite shows! Watch your favorite movies on the 100" projection screen with 1080p theater project complete with an Xbox 360, Blu-ray player, Apple TV 2, surround sound and leather stadium style seating. Head up to the game and arcade room for more family fun. Choose from a 60-in-1 multi-arcade machine, pool table, PlayStation 4, Golden Tee with 55-Inch TV, Disco Glow Arcade, and chess table. While unleashing your competitive side, enjoy surround sound with 60-Inch and 55-Inch SMART TVs, Blu-ray player, wet bar and wine cooler. From the games room, step out onto the balcony to enjoy the great views with a drink in hand while playing foosball or lounging in the luxury patio furniture. There is a second games room located on the ground floor. The games room features Star Wars Pod Racer arcades, air hockey table, 47-inch SMART TV x4, Xbox One, and PlayStation 4. There is so much fun throughout the house for everyone to enjoy. I cant wait to stay at one of these homes again. It was a wildest dreams experience.